Like you, we care deeply about health communication and, simply put, we believe we can achieve more through collaboration than competition. By bringing together health communication professionals and scholars from various settings and sectors we aim to create new opportunities to strengthen and grow the field. As the healthcare and public health fields become more fragmented and competitive, the Society for Health Communication provides an opportunity to bring together professionals from all levels and sectors of government, nonprofits, industry (including health care, public health, communication, and technology), and academia. 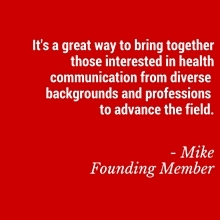 We are a member-driven organization with a key focus on networking opportunities that connect diverse individual and organizational members who want to meet others in our field, get connected with today’s thought leaders, and help shape the future of health communications. With students, early-career professionals, and seasoned experts as members, the Society for Health Communication provides the opportunity to connect with a wide variety of professionals. We are a new kind of professional organization that heavily leverages digital and social media to deeply engage all of our members and connect them with one another. Through your participation, you can help identify talent and dramatically expand your network of health communication professionals. As the Society for Health Communication grows, we will be looking to our organizational members to participate in shaping our various networks of practice, which may include areas such as digital health, health literacy, program evaluation, or many other areas. These member-led focus areas are an opportunity to demonstrate your subject matter expertise, showcase your in-house talent, and connect with potential new partners. In addition, organizational members will have the ability to promote selected events and activities through the Society mailing list and through Society publications and promotions. Organizational memberships are offered on a tiered basis and initial pricing is based on the industry type and size measured by number of full time equivalent (FTE) employees. An organizational membership includes enrollment of the organization and includes several individual memberships for identified employees. All memberships are annual and valid for one year from payment date. For additional information about Organizational Memberships, contact Erin Norvell at [email protected].